Since the 60s he was or is active for the Swiss and European jazz/new music scene as a musician, organizer, music unionist, music researcher, writer, teacher, lecturer and radio editor. He has been awarded with several culture prices. Co-founder of musicians' organisations and the independent CD label Unit Records which is now owned by the Swiss musicians. Building bridges, opening doors. 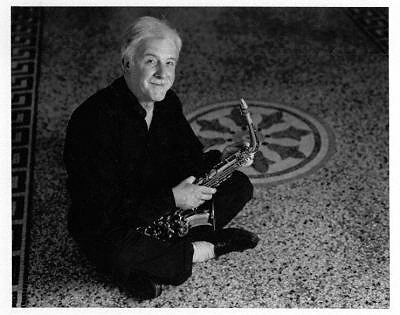 Saxophonist, musicologist and broadcaster Solothurnmann (1943) started out with blues, postbop and latin music but for a long time has enjoyed to team up with flexible improvisers from diverse backgrounds. During the years his music has changed and "reinvented" itself several times. Concerned with the development of an authentic contemporary expression, it lives and evolves in the large transitional zone of various mentalities, cultures and esthetics. Today, his playing integrates and transforms a variety of musical approaches ranging from folklore imaginaire to new jazz and speech-like or pointilist sound events. He is fascinated by the miriad of singing and instrumental esthetics in world- and experimental music and enjoys collaborations with artists from other media (film, acting, modern dance, instant poetry, painting and art performance). He collaborates and still studies with musicians from Europe, the USA and the Orient. Among his post bop, free music and new jazz formations were Uepsilon, At the Crossroads, First Aid Band (1985-92), the Alpine Jazz Herd (1983-94) which combined and confronted old Swiss folk music with contemporary jazz - and more recently the Swiss-Romanian The Magic Triangle, the Agasul Ochester (1990-2004), Alive According To E.E.Cummings, Potage du Jour, September Winds, Zone Franche, Transit (with Michael J.Stevens), Ensemble Free Sound (including the duo Pro Contemporaneo) in Bucharest und Next (the follow-up of Agasul). In Solothurnmann's work the contemporary jazz is sided by the tradition of europan music, especially by the folkore of his native Switzerland which was brought to a humorous synthesis with improvised rhythmical music in his band project The Alpine Jazz Herd. Studying extra-european music cultures and european folkmusic he found a wealth of natural voices, sounds and mentalities comparable to the high times of free jazz. A modern player doesn't need to suppress his ethnic roots. Therefore untempered archaic music interests me as much as the newest developments in music. I believe that the musical discourse is a part of the global discourse which now has become a matter of survival. His playing grew on the fundament of essential stylists of the free jazz period like Albert Ayler, Don Cherry, John Coltrane, Pharoah Sanders und Ornette Coleman but rests also on the two pillars Charlie Parker und Sonny Rollins. As a composer he feels committed to the how as much as to the what. In fact, he is a conceptualist in the service of improvisation. He emphazises the blues-relatedness and the polythematic concept of Charles Mingus, the sketch-like writing of the early Carla Bley but also Thelonious Monk, Andrew Hill, Roscoe Mitchell, Anthony Braxton, and composers ranging from Debussy to postmodernism. The jazz writer Bert Noglik wrote: The Alpine Jazz Herd, which he co-founded, showed on a high level of abstraction but also with emotional immediaticy what possibilities can open up if jazz musicians refer to their european roots. Open to everything he is an improviser/creator who can generate a vivid sound excursion which always is authentic music, too. Because whatever Solothurnman relizes as an improviser and whatever the number of sources of inspiration he never becomes banal or kitschy.